In the span of 16 years, liberal directors Robert Mueller and James Comey transformed the FBI from an illustrious crime fighting organization to a politically correct retribution machine that is answerable to no one, intelligence and FBI sources say. “Once a bastion of conservative anti-communism under long-time director J. Edgar Hoover, the FBI has become one of the more liberal political agencies of government, and some critics say appears increasingly to operate outside normal constitutional controls,” Bill Gertz wrote in a Dec. 6 analysis for The Washington Free Beacon. 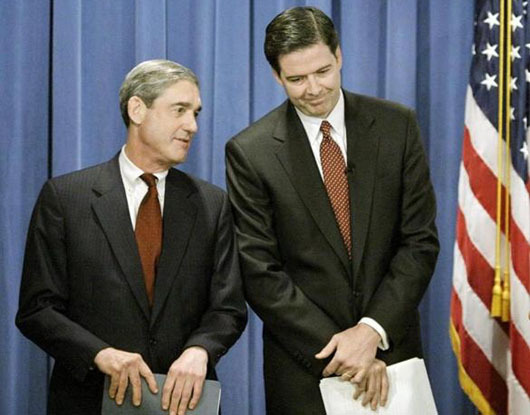 The FBI’s transformation began in 2001 under then-Director Robert Mueller, left, and continued under Mueller’s successor, James Comey. Under Mueller, who headed the agency from 2001 to 2013, and Comey, who succeeded Mueller and served as director until he was fired by President Donald Trump in May, the FBI has come to regard itself as a power center that the White House can’t control, critics say. That elected official is Trump, who special counsel Mueller and his team of mostly-liberal prosecutors are said to be going after full throttle in retaliation for the president’s daring to criticize the FBI. “Mueller, Comey, and (deputy attorney general Rod) Rosenstein are going to make Trump pay for having dissed the bureau,” the former official said. The agency’s current brass also seem to ignore the fact that the Constitution makes clear the FBI, as an executive branch agency, is ultimately responsible to the president. For years under both Mueller and Comey, the FBI has also has stonewalled congressional overseers. Trump took aim at the FBI in tweets and comments this week. “Tainted (no, very dishonest?) FBI ‘agent’s role in Clinton probe under review.’ Led Clinton Email probe. @foxandfriends Clinton money going to wife of another FBI agent in charge,” Trump tweeted on Dec. 3. “After years of Comey, with the phony and dishonest Clinton investigation (and more), running the FBI, its reputation is in Tatters – worst in History! But fear not, we will bring it back to greatness,” the president also declared. On Dec. 6, Mueller appeared to counter Trump’s comments by leaking word the special counsel has issued subpoenas for bank records at Deutche Bank related to Trump and members of his family. Under President Barack Obama, “the FBI suffered a string of failures that critics blame on the FBI being pressured by liberal, politically correct policies that emphasized diversity and multiculturalism of its workforce over competence and results,” Gertz wrote. The FBI’s shift to the left on Obama’s watch was “evident whenever a U.S.-based terror attack or other major crime takes place and the FBI, seemingly ever on the lookout for ways to protect its reputation, puts out word to pro-FBI news reporters that the problem is less serious than it is,” Gertz wrote. John Guandolo, a former FBI counterterrorism agent, criticized the FBI for yielding to pressure from Muslim groups in watering down its training of agents by limiting references to Islam and jihad, or holy war. An FBI source told Gertz that Comey’s politically charged handling of the Hillary Clinton email investigation upset many of the FBI’s agents who saw it as a disheartening indication of political bias in favor of Clinton. National security strategist Angelo Codevilla attributed much of the FBI’s problem to careerism and an out of control bureaucracy.